The movie revolves mainly around the events that surrounded Susan Murphy’s (Reese Witherspoon) wedding day. She planned to wed local weatherman Derrick Dietl (Paul Rudd) but something went wrong. Susan was hit by a meteorite full of quantonium. Susan’s body absorbed the quantonium which caused her to grow into a giant. I don’t recall them ever giving her new height, but she is taller than most buildings. If you haven’t figured it out yet, this movie has an All-Star vocal cast. Monger is the head of a top secret “prison” that houses monsters, like Ginormica. Ginormica meets other monsters in prison. B.O.B or Benzoate Ostylezene Bicarbonate (Seth Rogen) is a blue indestructible gelatinous blob created when a snack food company combined a genetically altered tomato with a chemical injected ranch dressing. Yes, really. That is his back story. He is a monster because he is ALWAYS hungry and can eat (and break down) just about anything. Dr. Cockroach (Hugh Laurie – in non-American accent) is a mad scientist that in an attempt to get the survival properties of a cockroach, became a human sized cockroach! The Missing Link (Will Arnett) is, well, a missing link. He is a 20,000 year old fish/ape hybrid that was found frozen in a block of ice. The final monster is Insectasaurus (Conrad Vernon who directed the movie) which was a small grub before being transformed by nuclear radiation. Going from one inch to 350 feet tall. Insectasaurus cannot speak clearly and is mesmerized and will follow any bright light source. 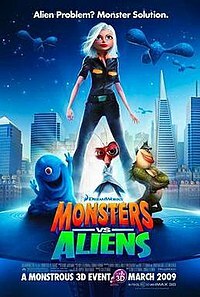 The monsters are called to action when an Alien probe lands on Earth and starts destroying it. The probe is looking for the quantonium and attempts to capture Susan when it sees her. The President of the United States (Stephen Colbert) allows W.R. Monger to release the monsters. They have had no military training, but thanks to Susan’s new super strength they defeat the probe. Once the quantonium is removed from Susan she returns to normal size and strength. She and the other monsters decide to do what they can to stop Gallaxhar and his clones. Susan uses her new found self confidence to battle without the strength she had before. The movie, of course, has a happy ending! I will not give away how the monsters and Susan are able to defeat the powerful Gallaxhar. The movie is full of comedy and not all of it just for the kiddies. B.O.B. will make you snort at least once and Stephen Colbert is just awesome. His first attempt at communication with the Alien probe is priceless. The visuals are VERY well done. I know, it is a cartoon, but it really looks good. Did I miss something without the 3D? Maybe, I do know they did the old bouncing ball on a string trick and at the end of the tag the President sticks his head into the audience. The bottom line is I REALLY enjoyed this movie, with or without 3D. The voice acting is amazing (which is apparent by the A-List actors they hired) and the visuals, as I said, are good. The story line is good, if not a little predictable. But this is really a kids movie. I look at it like Shrek, good for the kids and GREAT for the kids at heart. I would give this movie 4 out of 5 stars. If you have kids, go NOW! If you don’t have kids but really liked Shrek, go see it. If not, I definitely say this would be worth a rental!